Because they are resolution-independent, CSS effects scale up smoothly when zoomed. Text formatted with CSS is searchable; images are not. CSS is compact and compresses well compared with graphic images. CSS is just text; it can be quickly modified using a text editor or the output of a script. Safari supports CSS visual effects on Mac OS X and iOS. 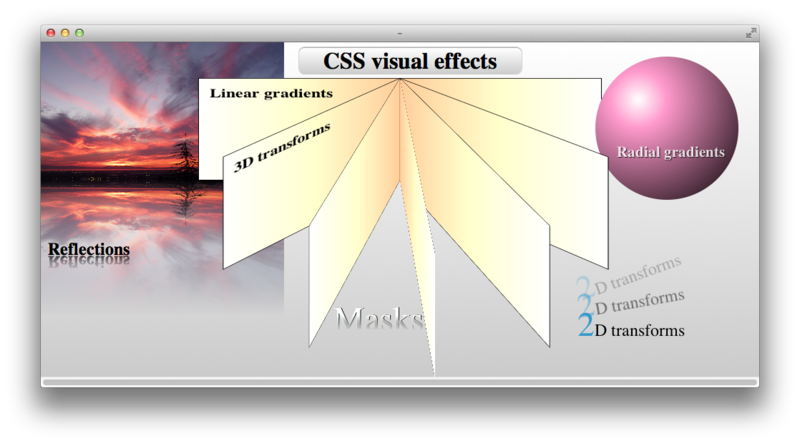 Safari CSS visual effects fall into three categories: new visual CSS properties, animation, and 2D and 3D transforms. New visual CSS properties include gradients, masks, reflections, and filters. Gradients let you add beautiful, resolution‐independent color blends to backgrounds and borders, with a single line of CSS. Use masks to render portions of HTML elements transparent for elegant compositing. Apply a mask as you would a background or a border image. You can use an image as a mask. You can also use a gradient as a mask, and you can mask any HTML element, not just images. Add a reflection to any element; use a gradient as a mask for a reflection to make the reflection fade to transparency. Filters allow you to add hardware-accelerated visual effects to HTML elements, including images and videos. Relevant chapters: Using Gradients, Using a Gradient as a Mask, Using Reflections, Using CSS Filters. CSS animations come in two flavors: implicit animations that render changes smoothly over a defined period, and keyframe animations that allow for more complex behavior, such as moving from side to side or starting and stopping en route. Relevant chapters: Animating CSS Transitions, Animating With Keyframes. You can apply 2D or 3D transforms to any HTML element, turning a group of div elements into the faces of a box or the pages of a book, for example. Apply perspective and animation, and you can open and close the box, turn it to look inside, flip the pages of the book, and so on. 2D transforms include scaling, translation, shearing, reflection, and rotation. 3D transforms add rotation about the x and y axis and displacement on the z axis. Relevant chapters: Using 2D and 3D Transforms, Adding Interactive Control to Visual Effects. The visual effects described in this document are WebKit extensions of CSS. Most of the extensions are proposals for W3C standards; some are in W3C drafts for CSS3. As the standards evolve, syntax for these effects is modified. This change is done carefully to allow new syntax to coexist with existing syntax, however. This means you can experiment with CSS extensions without having your website suddenly break when the standard is modified—in most cases, the old syntax still works. This document describes the current syntax as of this writing; many of the extensions have prior syntax that still works but is no longer recommended. Note: Because these extensions are WebKit-specific, they are not supported in all browsers. Most of the extensions have equivalents in other WebKit-based browsers, however, and for mobile-specific sites, WebKit-based browsers account for nearly all traffic. Many of the extensions are currently in W3C working drafts and have equivalents in non-WebKit browsers as well, using the same syntax. Nevertheless, unless you are writing an iOS web app, you should code your website to degrade gracefully for browsers that do not support these extensions. For the most part, this is automatic—an image may not have a reflection in some browsers, or a change in CSS properties may be immediate instead of animated—but the site remains functional and the layout is not broken. As always, you should test your website using all the browsers that you wish to support to ensure that all of your users have an aesthetically pleasing experience. Safari CSS Reference—describes the CSS properties supported by various Safari and WebKit applications. Safari Web Content Guide—describes how to create content that is compatible with, optimized for, and customized for iOS. iOS Human Interface Guidelines—provides user interface guidelines for designing webpages and web applications for Safari on iOS. http://www.w3.org/TR/css3-transitions/—W3C draft for animated transitions. http://www.w3.org/TR/css3-animations/—W3C draft for keyframe animations. http://www.w3.org/TR/css3-2d-transforms/—W3C draft for 2D transforms. http://www.w3.org/TR/css3-3d-transforms/—W3C draft for 3D transforms.